Which Yankees could see their numbers retired in the future? I wrote recently here on the blog about Derek Jeter and the scheduled retirement of his iconic no. 2 in Monument Park this summer. The Yankees have certainly retired a lot of numbers throughout their history and have retired several more even within the last few seasons. Now following the retirement of Jeter’s number this upcoming season and the retirement of Joe Torre’s No. 6 during the 2014 season, the Yankees will no longer have any single digit numbers available in the future which is pretty remarkable considering that a lot of teams don’t even have nine (or in this case ten) players to consider retiring numbers for. As ridiculous as it may seem at times, if you ask any Yankee fan, I’m sure they would bring a strong defense for any of these players, but discussing those numbers that have already been retired is not why I’m here today. Instead, I’m going to look at and discuss a few candidates for the next number we could see the Yankees retire sometime in the future. The Yankees have obviously been fortunate to have such a high number of incredible players come through their organization over the years. It does seem at times that they get a bit carried away with the whole number retiring thing but this is the way the organization chooses to honor the heroes of their numerous championship eras. The members of those great teams of the 90's and early 2000's all left around the same time and that led to several retirement ceremonies over the last few seasons. On the flip side of that is the fact that, looking at the recently departed and retired Yankees, I believe it could be quite a long while before we see another number retirement. Now there isn’t really a formula or list of criteria for determining why to retire a player’s number but usually it’s for the players like the Derek Jeter and Mariano Rivera who spend their whole careers with the team or significant portions at the very least. Sometimes it happens for players who spend a short period of time with the team but accomplish a great deal in that time like Reggie Jackson, but usually it’s for the former. With that in mind and with the help of Baseball References’ handy uniform history chart, I’ve come up with a few candidates that I think the Yankees might consider for Monument Park in the future. 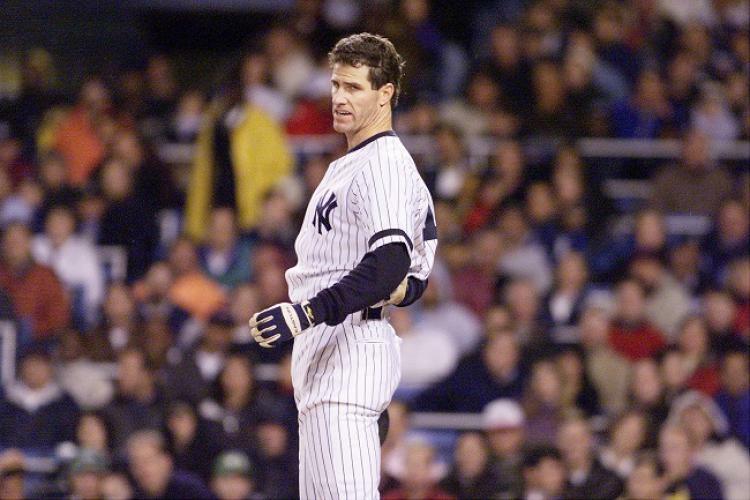 Affectionately referred to by fans as “The Warrior”, Paul O’Neill spent the final nine of his 17 major league seasons with the Yankees. He was commonly seen patrolling right field and batting in the third slot in the lineup and was at the center piece of the four World Series titles the team won in the 90's and 2000's. For his Yankee career, he batted .303 with 185 home runs and 858 RBIs. He also won the American League batting title in 1994 and was elected to the All-Star team in four of his nine seasons with the team. For his postseason career, he had a .284 batting average with a .363 on base percentage, 11 home runs and 39 RBsI. Perhaps the highlight of his postseason career was his performance in the 2000 World Series against the Mets where he batted .474 with two triples, nine hits and 15 total bases in five games. 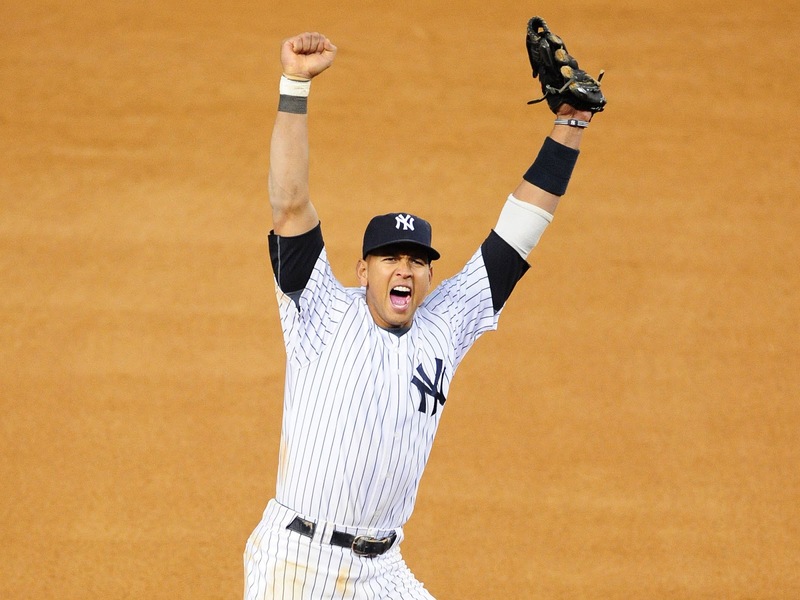 He rose to the occasion time and time again for the Yankees and did so by giving his all every day, often displaying intense fire and passion on the field during games. Although he left the team as a player in 2001 he hasn’t gone too far, appearing regularly in the YES Network booth throughout the season. His number 21 jersey has been worn just twice since his departure, both times for very brief stints by LaTroy Hawkins and Morgan Ensberg in 2008. Whether or not this is some form of unofficial retirement by the team, we may never know but based on his accomplishments in Pinstripes, a number retirement for The Warrior would be widely applauded by the fans and more than deserved. 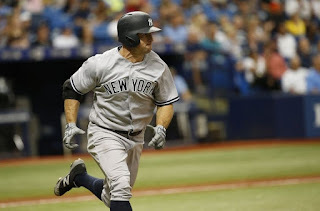 With the departure of Mark Teixeira this offseason it will presumably put an end to 15 consecutive years of the number 25 at first base for the team, with Jason Giambi manning the position and number for the team in the seven years prior to Teixeira. Although he missed significant periods of time due to injury, Mark Teixeira’s time on the team and in that number was far more memorable. Teixeira played eight out of 14 seasons for the Yankees and retired at the conclusion of this past season. Although his stats don’t jump off the page, he made memorable contributions throughout his time. He was always outspoken and honest and always seemed to be a good teammate and no matter how he was hitting he could always be relied upon to play stellar defense in the field. One of his most memorable moments with the team is his dramatic walk-off home run in game two of the 2009 ALDS. He did put together an impressive list of accomplishments in Pinstripes, hitting 206 homers in his eight seasons, winning three Gold Gloves, a Silver Slugger and putting up three consecutive 30 and 100 seasons to begin his Yankee career. 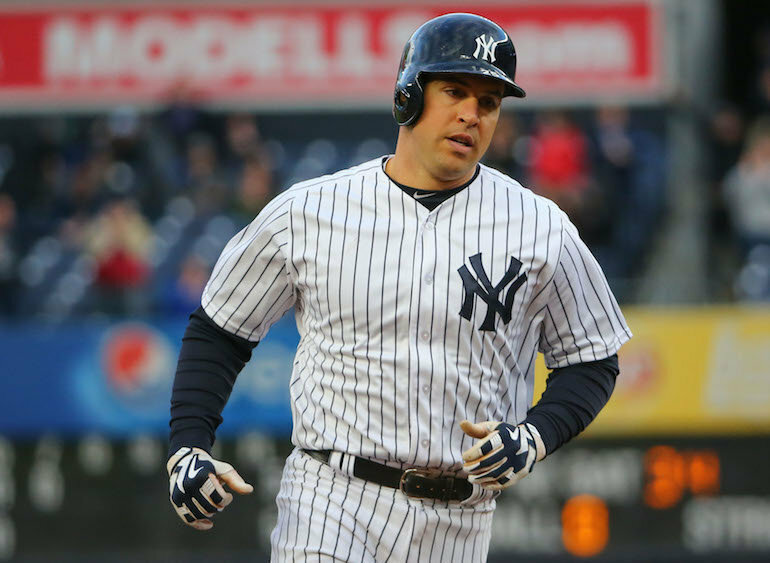 Overall Mark Teixeira was a consummate professional throughout his time in New York and at his best was a force at the plate and a wizard with the glove. I think it is this total package here that could earn him a spot in Monument Park. This one might be my toughest sell out of the bunch. Brett Gardner is the only active position player I have for you and on the surface, he doesn’t seem like a player who is on his way to Monument Park any time soon. Although his stats aren’t eye popping, he has been around for a long while and has been a solid contributor throughout his time here. For his career he owns a .264 batting average and a .346 on base percentage and has also been a very durable player, playing less than 145 games in just one season since becoming a full time player in 2010. He contributed valuable speed and defense during the Yankees 2009 World Series run and is one of the most successful homegrown prospects in recent memory. He has been the subject of almost nonstop trade speculation for the last few years but if he does last out his current contract he will have been with the team for 11 years. Similarly to Mark Teixeira, his numbers do not jump off the page but it is the total package here that should gain him consideration for this honor. 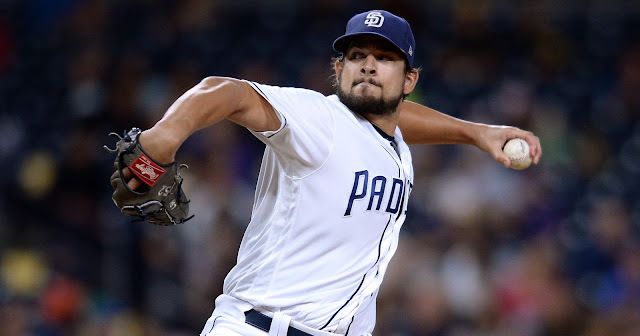 He could really help his case with a few strong seasons at the plate in the coming years while continuing to be durable and playing his usual good defense in the field. He is not the most spectacular player by any means but if a few things go his way I could see the Yankees deciding honor a homegrown player who served them faithfully for over a decade. The Yankees already have numbers 1-10 retired in Monument Park and in a few years we might just see number 11 out there as well. Entering the final season of his contract, the long time ace of the Yankees will present a legitimate chance at getting his number 52 retired by the New York Yankees. Although his last few seasons have shed a negative light on his Yankee legacy, Sabathia is a guy who the Yankees may deem worthy of this prestigious honor one day. Sabathia joined the Yankees organization before the 2009 season. Anchoring the rotation throughout the season and throughout the postseason, Sabathia and company captured the franchise's 27th World Series title. During his first three seasons with the Yankees, Sabathia finished fourth, third, and fourth in Cy Young voting, and he also received MVP votes in each of those seasons. In his Yankee career, Sabathia has three All-Star appearances to go along with a 106-68 record, 3.75 ERA, and 1333 strikeouts. Sabathia will not only be a pitcher who may be honored by the Yankees, but his numbers may also reward him with Hall of Fame consideration in the coming years, but that will be contingent on how many more seasons he plays after his contract expires following this 2017 season. This is the elephant in the room for all of us although I can’t tell if I left him for last because he is the most controversial or the most unlikely candidate of the bunch. Alex Rodriguez retired from the Yankees this past August during the season, marking the end of his playing career and the departure of the longest tenured member of the team. All told, he played 12 years for the team finishing with a .283 batting average, 351 home runs and 1096 RBI. 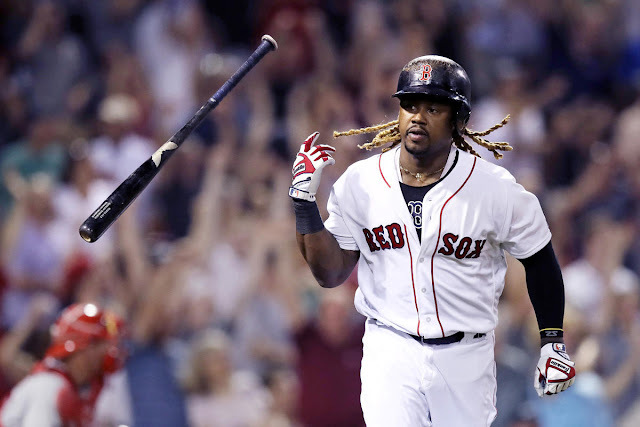 For his career, he is also a member of the 600 home run club and the 3000 hit club joining that club with a home run, accomplishing something only two other players have done (Derek Jeter and Wade Boggs). Although the story of his career became much more complicated near the end, he always did have a knack for the spotlight and provided several dramatic moments over the years. His performance during the 2009 postseason was especially memorable batting .365 with six homers and 18 RBIs during the run to the title, a run that included his game tying home run off of Joe Nathan in Game two of the ALDS. He also won two MVP awards and delivered seven consecutive 30 and 100 seasons to start his Yankee career. As we all know, A-Rod came to be the poster boy for MLB's fight against steroid use, denying for years any wrong doing until he finally submitted and accepted a season long suspension in 2014. The fallout from that suspension was ugly and brought about a lot of acrimony between him and the Yankees. He made his return in 2015 seemingly humbled by his experiences and displaying a new found joy to be able to play baseball again. Although that bitterness between him and the Yankees was very real the team saw fit to give him one final moment in the spotlight to end a truly one of a kind career. His knowledge of the game and ability to relate this to others led the Yankees to bring him back into the organization in a special advisors role where he will be mentoring the next generation of Yankee prospects. Only a few really know where his relationship with the Yankees’ brass stands and how his role with the organization will evolve going forward but Alex was something special to watch and did genuinely seem to enjoy the spotlight that came with being a member of this storied franchise. If it were strictly based on performance it would be no question. Of course it’s not that simple. For Alex, it never was. The Yankees have seen so many great players don the Pinstripes over the years and I have been fortunate to witness several of these players in my time. The recently departed generation of Yankee greats provided so many great memories and truly proved their worthiness for immortality in Monument Park. Although the Yankees haven’t had nearly the same amount of success as a team since those days of the late 90's and 2000's, they have still had great players and memorable moments and I believe these players, having contributed to those successes should and could be considered for that honor in the future. It is not something that we should take for granted but the Yankees are no ordinary franchise, and these players are far from ordinary as well. 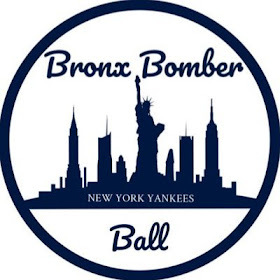 Who do you think could make it Monument Park in the future?